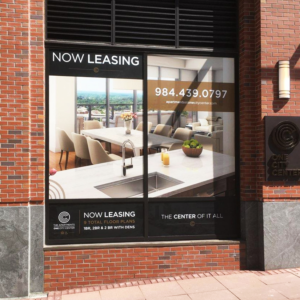 Sharpe Co. produced & installed the vinyl window graphics on multiple street level locations to market the tower’s available real estate. This custom rolling shadow box with engraved logo board and lighting was made completely at Sharpe Co. 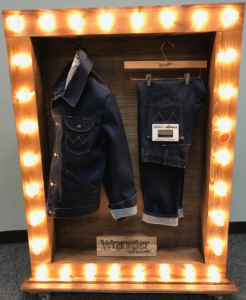 This is used on display in the VF Jeanswear NY Showroom as well as the office located in Greensboro, NC. 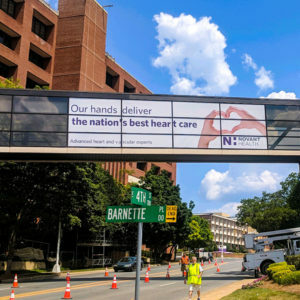 Novant Health Presbyterian Medical Center Skywalks; This project consisted of window perf printed & installed on two separate skywalks, visible by traffic in both directions. This project required lane closures and weekend installation. 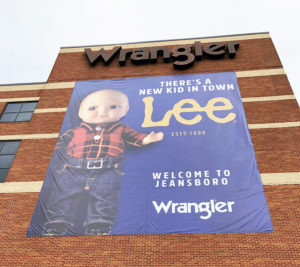 We used an 80' lift to install a 30'x35' banner as well as an 15'x18' banner at the Wrangler HQ store in Greensboro, NC. 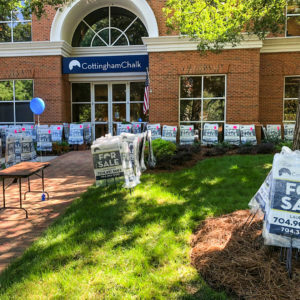 Cottingham Chalk Real Estate Company recently rebranded and enlisted Sharpe Co. to print real estate signage, stationary, and other marketing collateral. 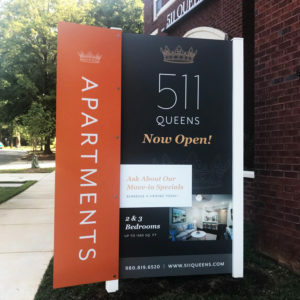 We produced and installed the 511 Queen sign which incorporated a side blade. The complex is My Niche Apartments in Charlotte, NC.